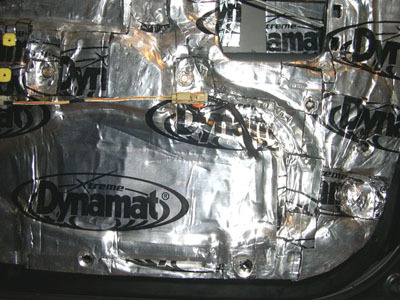 In car audio, installation plays a major role in how your end result will sound. When you visit a store, you will notice they have the speakers in their sound rooms mounted to thick wood baffles. This sturdy, non-resonant mounting surface lets the speakers perform to their best ability. Now, if you buy a set of these speakers and simply mount them to the flimsy sheet metal in your door, you will probably be a bit disappointed with the speaker's response. This is due, in part, to the sheet metal flexing and resonating along with the music...creating speaker panel distortion which reduces the sound quality. The bad news is, the distortion usually gets worse the louder you turn up the volume, due to the increased energy the speaker is inflicting on the panel. However, the good news it that you can almost completely eliminate this speaker panel distortion by properly applying a sound damping material to the door. By doing this you will notice a fuller sound to your music, stronger and more defined midbass, some nuances you have been missing all along, and even a reduction in road noise. All of this adds up to more effective use of available power. You will notice that the music is more balanced at all listening levels, that you do not have to turn the volume up as much to achieve the same perceived volume as before, and will generally notice an overall increase in the volume of your door speakers of at least 3 dB...or about equal to a doubling of amplifier power. That is an amazing improvement. To complete this installation, you will require an assortment of tools depending on the hardware in your doors, but you will definitely need the following: a panel removal tool, a gasket scraper or flat head screwdriver, a razor knife, a good pair of scissors, and some goo-gone and degreaser. A wooden roller will definitely come in handy, and, depending on what type of damping material you use, a heat gun can be helpful as well. Our installation was performed on a Honda Civic using Dynamat Xtreme. 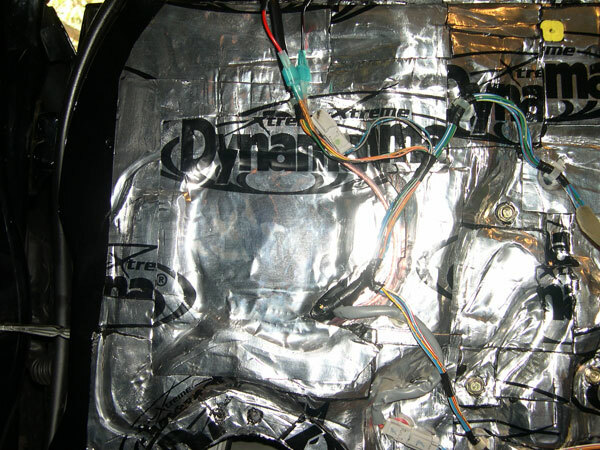 In this Civic, it at times it sounded like the speakers were distorting, but when the cover was removed and you listened from very close, the music was crystal clear...what was being heard was harmonic distortion from the door resonating. 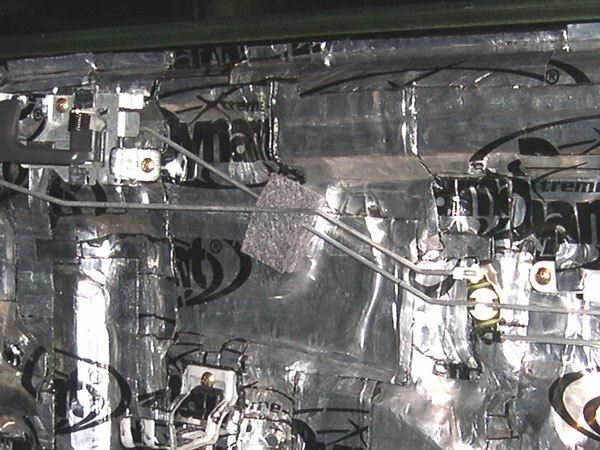 To take care of that, the following was done...and although some of the hardware and disassembly may be different on your car, the general principles are the same. 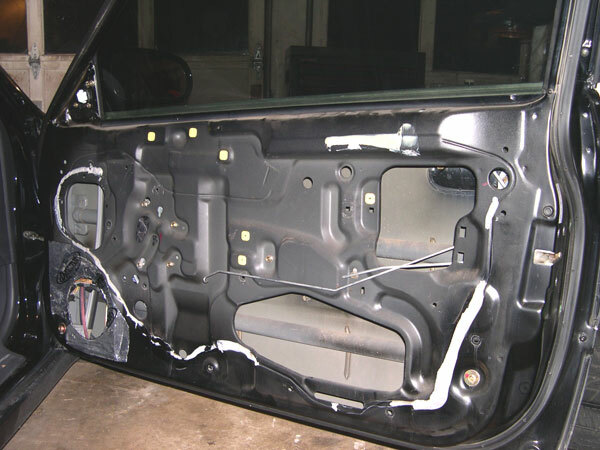 The first thing you will need to do is remove the doorpanel. You will most likely need to remove a few screws holding on trim pieces, the speaker, and a few screws behind the speaker cover. 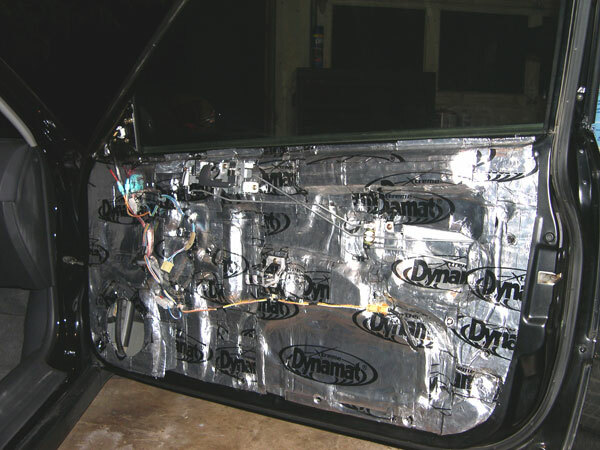 Once you have all of that out, there will be a series of plastic clips holding the panel to the doorskin...that is where your panel removal tool comes in. 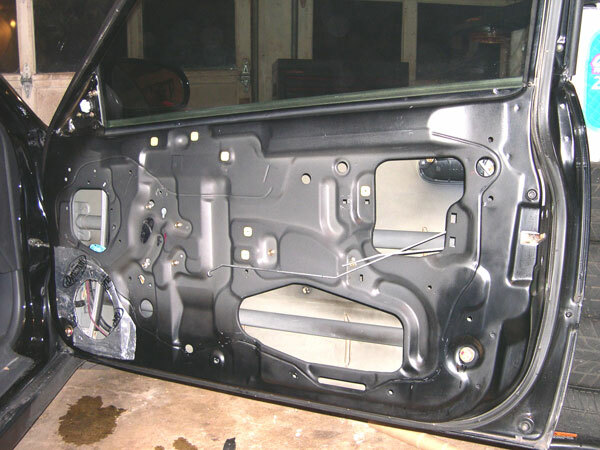 After you get the doorpanel off you should see something like this. 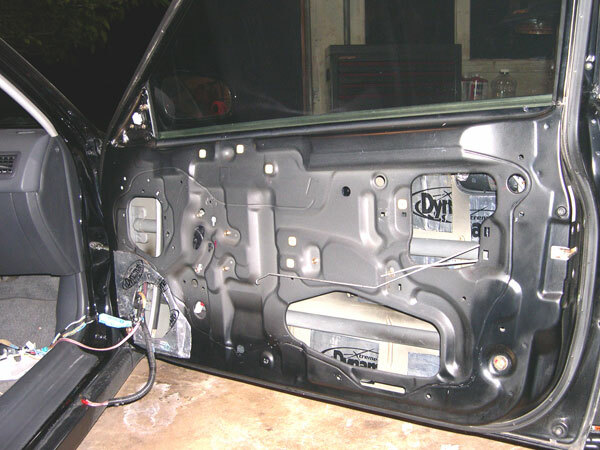 You can see that the door already has some damping material directly around the speaker mounting location...this just was not enough for the high powered MB Quarts the doors housed. 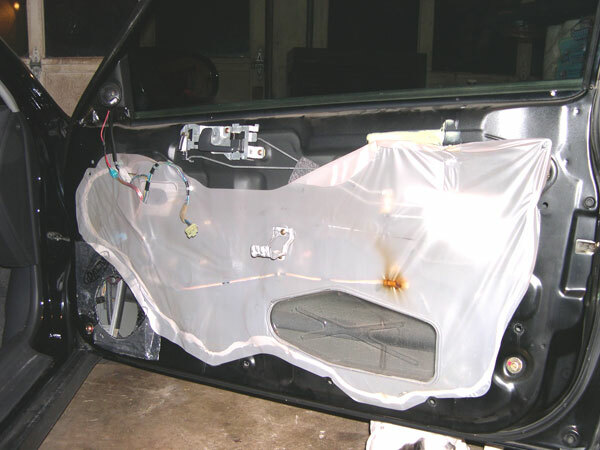 You will need to go ahead and remove and discard the plastic weather guard, the damping material will do this job for you now. Next you will need to disconnect all of the wires, I used a sharpie to label the ends of the less obvious ones, and where two wires plugged together I labeled each end with the same letter...this just makes it easier on reassembly. Take your time with the clips, so as not to break them. Once all of the clips are disconnected, you can tuck them inside the door, out of the way. The next step is to remove everything else that is attached to the door...such as the handle, the lock rods, the armrest support, and the guard that helps to prevent someone from jimmying the lock rods. 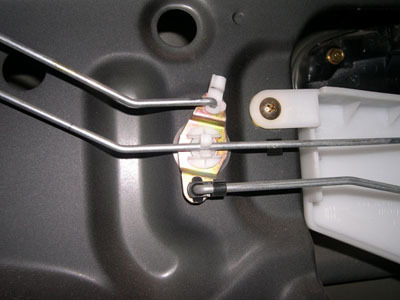 On my car the lock rods were held in place by a little clip that swings open to release them. 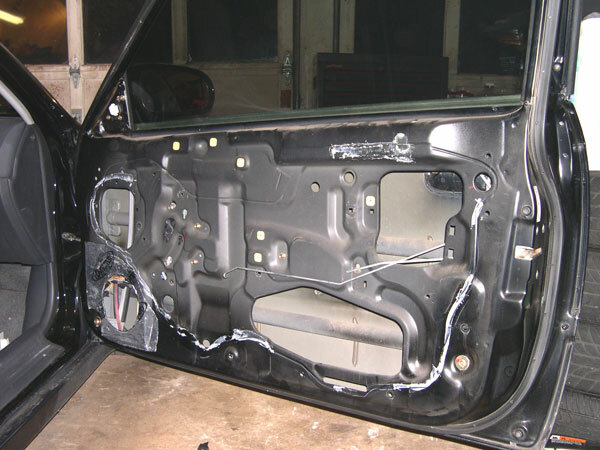 Once you have most of the goo removed, you will need to use a rag and liberal amounts of goo gone to get all that remains off the door. This can take awhile, but is an important step that really needs to be done. After all of the goo has been removed, you need to clean the door with some simple green or other degreaser. If you plan on applying damping material to the outside door skin as well, which is a good idea, then go ahead and clean it up too. 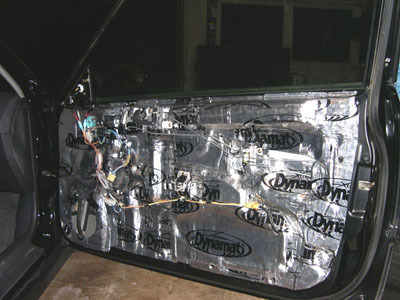 Once the door is dry, you can start applying the damping material. I went ahead and added some to the outside skin in order to help reduce resonance there as well. A few well placed blocks will dampen resonance, and when applied more liberally it will cut out more roadnoise. For the application, a small roller is recommended, and depending on what type of damping material you use, a heatgun is needed as well. In addition to the roller, you will use your fingers, and whatever else you have lying around that conforms to the area you are working on, to press the material into all of the grooves and crevices. I used various sized pieces of material depending on the contours of the area I was working on, and overlapped each piece about a 1/8 inch or so...more in some places. After I did the outside skin, I started on the inside skin. To work around the bolts, remove them one at a time, apply your damping material, cut out the hole for the bolt with your razor knife, and reinstall that bolt before removing another one. Also make sure to keep track of all the wire clip and doorpanel clip holes so you can cut them back out as well. Doing one half of the door as shown here, took about two and a half hours...with no breaks. However, those two and a half hours were spent making sure there were NO air bubbles in the material. To kill air bubbles just use a razor blade or something to pop them and then press it out and repeat as needed. Any air bubbles will hinder the performance of the material. At this point I took a long break. 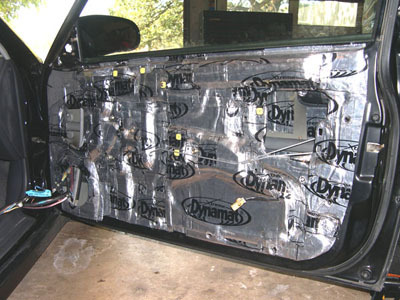 When I went back I did the other half of the door, and then set out to cover the large holes to help cut out road noise. I then put all the wires back in place. In order for the wire clips to go back in, you will need to use the handle of a screwdriver or something to make a deep indent in the damping material around the clip holes. When sealing up the large holes you want to leave enough room for the wires to pass through. Next you have the area where the lock rods pass into the door. Here you can see that I put some material over the bolts for the outside door handle...I did this with the bolts for the window mechanisms and track as well. Why? 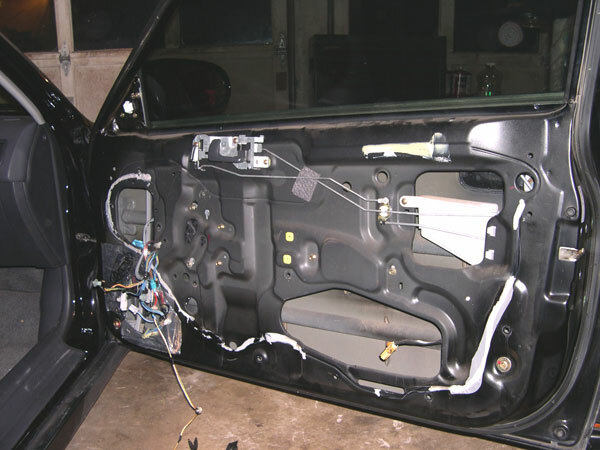 Well, I did the driver side door first, and when I got done and tested it out, the outside door handle started rattling pretty bad after a minute or so at high volumes. I removed the doorpanel, and the bolts for the handle and the window mechanisms had rattled loose. This might not be an issue with low powered systems, but if you have a good bit of power going to your speakers, you might want to do this step. I have about 180 watts RMS per side going to the MB Quart components...and these are just 5.25"...so I can see this being a serious issue with 6.5" or larger speakers in high powered systems...this was not an issue before damping the door. So, I tightened up the bolts and put some Dynamat over the heads and have had no more problems. Now, on this location, you just want to cover it up as best you can without interfering with the operation of the lock rods. A little patience and test-fitting will pay off here. Next you will need to reinstall the items like the handle and the armrest support...but you should give them a treatment of damping material as well. You will know when you have enough on them when they do not ring when dropped. 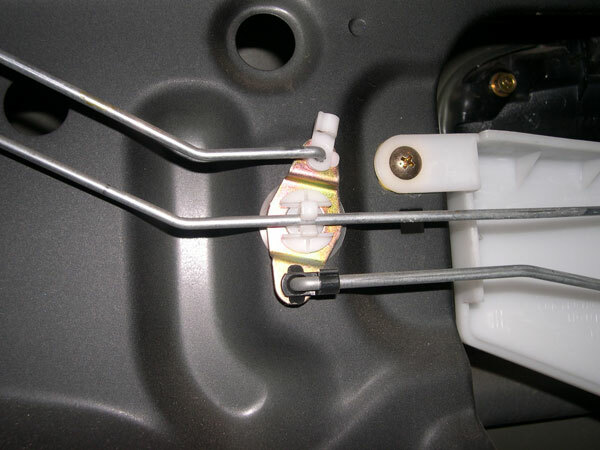 The last addition is the little piece of material that keeps the rods from hitting each other. After you have everything reassembled you will see where the rods cross. Add a little 3M spray glue on the back of the piece, and press it into place. After that, your door is done. 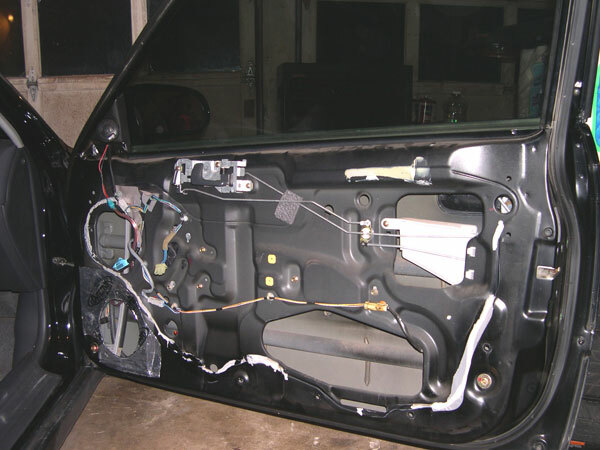 All that remains is to replace the doorpanel and your speakers and test it out. 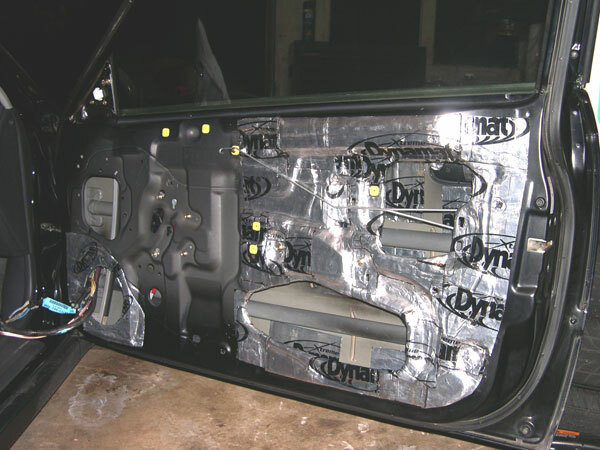 This is a very time consuming process, but the results are well worth it...and for those of you that are concerned about weight gain, and what tuner wouldn't be, this added a total of about 5.5 pounds per door. 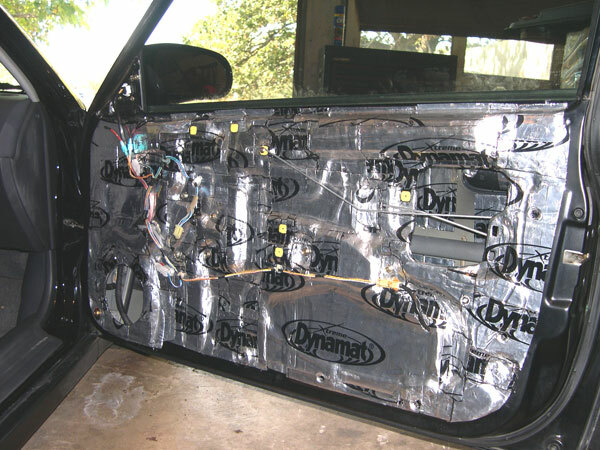 [b]Car Audio Tech: Damping Your Doors For Better Sound[/b] Article By [url=http://georgebelton.com]George Belton[/url] In car audio, installation plays a major role in how your end result will sound. When you visit a store, you will notice they have the speakers in their sound rooms mounted to thick wood baffles. This sturdy, non-resonant mounting surface lets the speakers perform to their best ability. Now, if you buy a set of these speakers and simply mount them to the flimsy sheet metal in your door, you will probably be a bit disappointed with the speaker's response. This is due, in part, to the sheet metal flexing and resonating along with the music...creating speaker panel distortion which reduces the sound quality. The bad news is, the distortion usually gets worse the louder you turn up the volume, due to the increased energy the speaker is inflicting on the panel. However, the good news it that you can almost completely eliminate this speaker panel distortion by properly applying a sound damping material to the door. By doing this you will notice a fuller sound to your music, stronger and more defined midbass, some nuances you have been missing all along, and even a reduction in road noise. All of this adds up to more effective use of available power. You will notice that the music is more balanced at all listening levels, that you do not have to turn the volume up as much to achieve the same perceived volume as before, and will generally notice an overall increase in the volume of your door speakers of at least 3 dB...or about equal to a doubling of amplifier power. That is an amazing improvement. 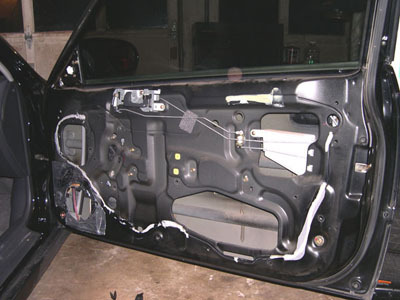 To complete this installation, you will require an assortment of tools depending on the hardware in your doors, but you will definitely need the following: a panel removal tool, a gasket scraper or flat head screwdriver, a razor knife, a good pair of scissors, and some goo-gone and degreaser. A wooden roller will definitely come in handy, and, depending on what type of damping material you use, a heat gun can be helpful as well. 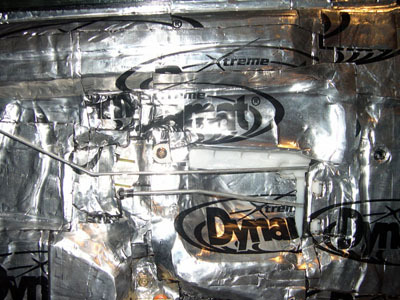 Our installation was performed on a Honda Civic using Dynamat Xtreme. In this Civic, it at times it sounded like the speakers were distorting, but when the cover was removed and you listened from very close, the music was crystal clear...what was being heard was harmonic distortion from the door resonating. 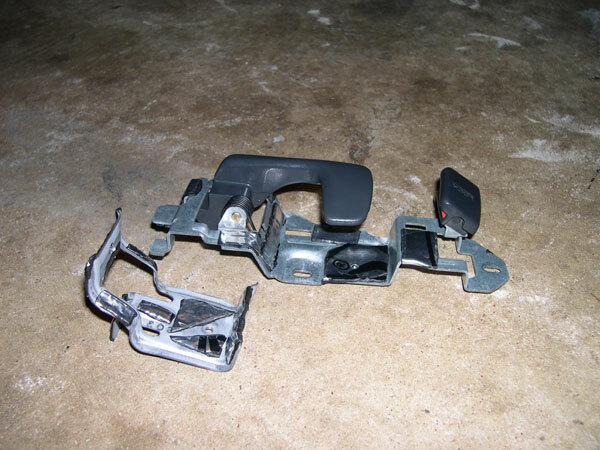 To take care of that, the following was done...and although some of the hardware and disassembly may be different on your car, the general principles are the same. The first thing you will need to do is remove the doorpanel. You will most likely need to remove a few screws holding on trim pieces, the speaker, and a few screws behind the speaker cover. Once you have all of that out, there will be a series of plastic clips holding the panel to the doorskin...that is where your panel removal tool comes in. 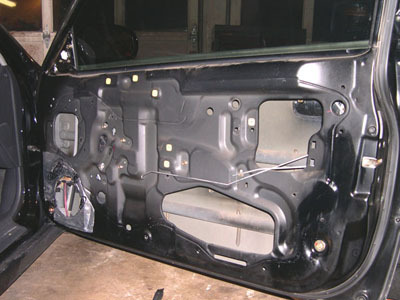 After you get the doorpanel off you should see something like this. 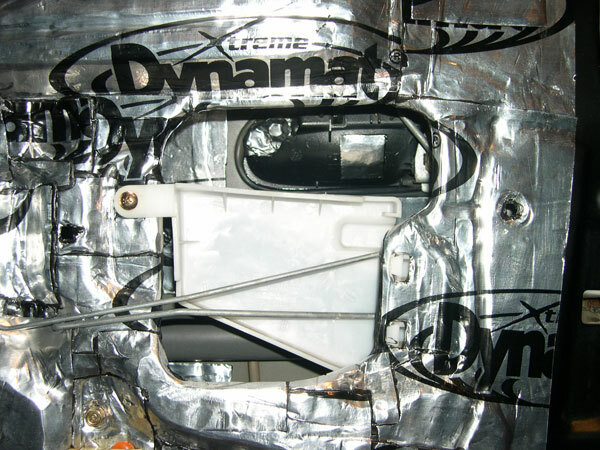 You can see that the door already has some damping material directly around the speaker mounting location...this just was not enough for the high powered MB Quarts the doors housed. [img]http://georgebelton.com/6g.civic.tech/dampen.doors/deaden_doors_01.th.jpg[/img] You will need to go ahead and remove and discard the plastic weather guard, the damping material will do this job for you now. [img]http://georgebelton.com/6g.civic.tech/dampen.doors/deaden_doors_02.th.jpg[/img] Next you will need to disconnect all of the wires, I used a sharpie to label the ends of the less obvious ones, and where two wires plugged together I labeled each end with the same letter...this just makes it easier on reassembly. Take your time with the clips, so as not to break them. [img]http://georgebelton.com/6g.civic.tech/dampen.doors/deaden_doors_03.th.jpg[/img] Once all of the clips are disconnected, you can tuck them inside the door, out of the way. [img]http://georgebelton.com/6g.civic.tech/dampen.doors/deaden_doors_04.th.jpg[/img] The next step is to remove everything else that is attached to the door...such as the handle, the lock rods, the armrest support, and the guard that helps to prevent someone from jimmying the lock rods. [img]http://georgebelton.com/6g.civic.tech/dampen.doors/deaden_doors_05.th.jpg[/img] On my car the lock rods were held in place by a little clip that swings open to release them. [img]http://georgebelton.com/6g.civic.tech/dampen.doors/deaden_doors_06.th.jpg[/img] With the door clear of obstructions, you now need to clean it up...this is a very, very important step. 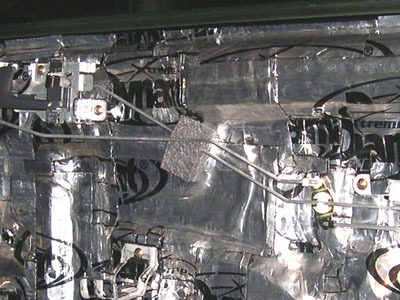 A clean surface will assure a long-lasting bond of the damping material, which is imperative for the best results. First you will scrape off the bulk of the goo that the plastic sheeting was affixed with...I used a gasket scraper here, but a flathead screwdriver will work too [img]http://georgebelton.com/6g.civic.tech/dampen.doors/deaden_doors_07.th.jpg[/img] Once you have most of the goo removed, you will need to use a rag and liberal amounts of goo gone to get all that remains off the door. This can take awhile, but is an important step that really needs to be done. [img]http://georgebelton.com/6g.civic.tech/dampen.doors/deaden_doors_08.th.jpg[/img][img]http://georgebelton.com/6g.civic.tech/dampen.doors/deaden_doors_11.th.jpg[/img] After all of the goo has been removed, you need to clean the door with some simple green or other degreaser. If you plan on applying damping material to the outside door skin as well, which is a good idea, then go ahead and clean it up too. 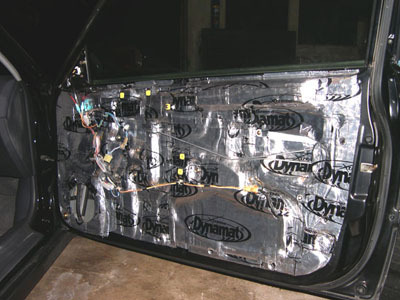 [img]http://georgebelton.com/6g.civic.tech/dampen.doors/deaden_doors_09.th.jpg[/img] Once the door is dry, you can start applying the damping material. I went ahead and added some to the outside skin in order to help reduce resonance there as well. A few well placed blocks will dampen resonance, and when applied more liberally it will cut out more roadnoise. [img]http://georgebelton.com/6g.civic.tech/dampen.doors/deaden_doors_10.th.jpg[/img] For the application, a small roller is recommended, and depending on what type of damping material you use, a heatgun is needed as well. In addition to the roller, you will use your fingers, and whatever else you have lying around that conforms to the area you are working on, to press the material into all of the grooves and crevices. I used various sized pieces of material depending on the contours of the area I was working on, and overlapped each piece about a 1/8 inch or so...more in some places. After I did the outside skin, I started on the inside skin. To work around the bolts, remove them one at a time, apply your damping material, cut out the hole for the bolt with your razor knife, and reinstall that bolt before removing another one. Also make sure to keep track of all the wire clip and doorpanel clip holes so you can cut them back out as well. Doing one half of the door as shown here, took about two and a half hours...with no breaks. However, those two and a half hours were spent making sure there were NO air bubbles in the material. To kill air bubbles just use a razor blade or something to pop them and then press it out and repeat as needed. Any air bubbles will hinder the performance of the material. [img]http://georgebelton.com/6g.civic.tech/dampen.doors/deaden_doors_11.th.jpg[/img] At this point I took a long break. When I went back I did the other half of the door, and then set out to cover the large holes to help cut out road noise. I then put all the wires back in place. In order for the wire clips to go back in, you will need to use the handle of a screwdriver or something to make a deep indent in the damping material around the clip holes. [img]http://georgebelton.com/6g.civic.tech/dampen.doors/deaden_doors_12.th.jpg[/img][img]http://georgebelton.com/6g.civic.tech/dampen.doors/deaden_doors_13.th.jpg[/img] When sealing up the large holes you want to leave enough room for the wires to pass through. [img]http://georgebelton.com/6g.civic.tech/dampen.doors/deaden_doors_14.th.jpg[/img][img]http://georgebelton.com/6g.civic.tech/dampen.doors/deaden_doors_15.th.jpg[/img] Next you have the area where the lock rods pass into the door. [img]http://georgebelton.com/6g.civic.tech/dampen.doors/deaden_doors_16.th.jpg[/img] Here you can see that I put some material over the bolts for the outside door handle...I did this with the bolts for the window mechanisms and track as well. Why? Well, I did the driver side door first, and when I got done and tested it out, the outside door handle started rattling pretty bad after a minute or so at high volumes. I removed the doorpanel, and the bolts for the handle and the window mechanisms had rattled loose. This might not be an issue with low powered systems, but if you have a good bit of power going to your speakers, you might want to do this step. I have about 180 watts RMS per side going to the MB Quart components...and these are just 5.25"...so I can see this being a serious issue with 6.5" or larger speakers in high powered systems...this was not an issue before damping the door. So, I tightened up the bolts and put some Dynamat over the heads and have had no more problems. Now, on this location, you just want to cover it up as best you can without interfering with the operation of the lock rods. A little patience and test-fitting will pay off here. [img]http://georgebelton.com/6g.civic.tech/dampen.doors/deaden_doors_17.th.jpg[/img][img]http://georgebelton.com/6g.civic.tech/dampen.doors/deaden_doors_18.th.jpg[/img] Next you will need to reinstall the items like the handle and the armrest support...but you should give them a treatment of damping material as well. You will know when you have enough on them when they do not ring when dropped. [img]http://georgebelton.com/6g.civic.tech/dampen.doors/deaden_doors_19.th.jpg[/img] The last addition is the little piece of material that keeps the rods from hitting each other. After you have everything reassembled you will see where the rods cross. Add a little 3M spray glue on the back of the piece, and press it into place. After that, your door is done. All that remains is to replace the doorpanel and your speakers and test it out. [img]http://georgebelton.com/6g.civic.tech/dampen.doors/deaden_doors_21.th.jpg[/img][img]http://georgebelton.com/6g.civic.tech/dampen.doors/deaden_doors_22.th.jpg[/img] This is a very time consuming process, but the results are well worth it...and for those of you that are concerned about weight gain, and what tuner wouldn't be, this added a total of about 5.5 pounds per door. You can find the full article with links to larger images [url=http://www.georgebelton.com/6g.civic.tech/dampen.doors/index.php]HERE[/url].